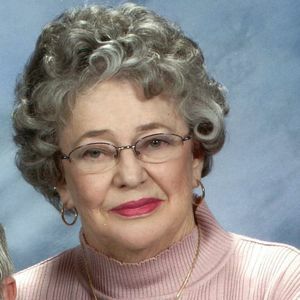 Mona Dean Hester Clark, 82, of Elizabethtown entered into eternal rest on Thursday, February 21, 2019. She was preceded in death by her husband: Hugh Clark, one grandson: Jeremy Moss and one brother: Mitchell Hester. Mona Dean leaves behind one son: Alec Clark (Cindy) of Elizabethtown; one daughter: Cindy C. Russell (Terry) of Elizabethtown; four grandchildren: Daniel Clark, Caitlyn Clark, Katherine Clark, and Alexander Clark, two great-grandchildren: Kaylee Clark and Anakin Moss, and one fur baby: Ginger. Mona Dean was a loving wife, mother and grandmother. She enjoyed spending time with her family and her faithful little companion Ginger. Mona Dean enjoyed attending her home church: Singletary United Methodist in Dublin where she was choir director. She also enjoyed fishing and cooking. Mona Dean was famous for her chicken and pastry, as well as cakes, cookies and lots of other delicious goodies. Her grandchildren often called her "Poppy Dean". Her favorite holiday was Christmas, with all the family together. Mona Dean was a true lady in all aspects. Her famous words "Oh my Goodness" will ring in the ears of all those who fondly remember her southern grace and charm. A visitation will be held on Saturday, February 23, 2019 from 6-8 pm at Bladen Gaskins Funeral Home in Elizabethtown. A funeral service is planned for Sunday, February 24, 2019 at 3:00 pm at Singletary United Methodist Church in Dublin with Rev. Lamont Hemminger and Rev. Sam L. Grist III officiating. Burial will follow the services in the Daniels Family Cemetery. Add your thoughts, prayers or a condolence to Mona Dean's guestbook.